While expanding all the time, our range of clinical programmes comprises skills from basic cardiopulmonary resuscitation (CPR), recovery and routine ward tasks to advanced neonatal life support and master classes in minimal access surgery and other pioneering techniques. A perfect mock-up of a UCH operating theatre, the innovative clinical simulation theatre offers the opportunity to attempt a complex procedure or simply practise routine operations under real pressure and in real-time. Images from various clinical programmes conducted to date are provided here, though for details of the full schedule and opportunities/suggestions for new courses please contact us. 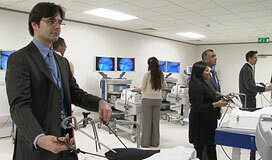 Featuring laparoscopic and endoscopic simulation trainers, the MAS centre has been designed specifically to facilitate group learning and supervision; a practicable solution to gaining hands-on training in intricate techniques. 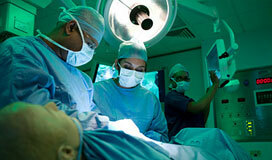 visit the Minimal Access Surgery website. 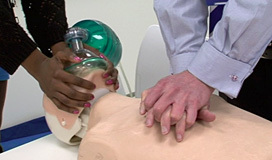 Participants use purpose-designed reactive mannequins, with every action recorded by camera and copied to DVD for subsequent appraisal; emphasis is placed on high-quality content and training participants to think and act calmly when under pressure.